With the help of Explore Information Services, Navajo Express has seen positive results pertaining to their fleet’s safety measurements and risk management. “Our partnership with Explore has not only improved Navajo’s bottom line, but our drivers and the motoring public are significantly safer from our perspective," states Jay Thomas, Navajo Express’ VP of Safety and Compliance. 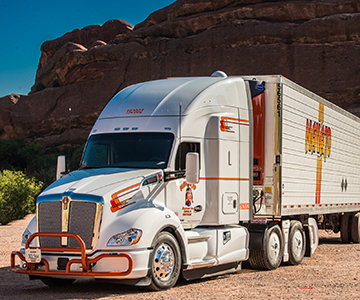 Navajo Express (“Navajo”), a nationwide shipping and trucking company, has seen dramatic safety results through its recent partnership with Explore Information Services (“Explore”), a Solera Holdings, Inc. (“Solera”) company, implementing SuperVision as a safety platform. Since Navajo’s application of SuperVision six months ago, the company has seen its CSA (Compliance, Safety, Accountability) score in the Driver Fitness category drop dramatically, driver safety improve and overall safety culture strengthen. SuperVision sends Navajo real-time alerts for all driving violations, such as DWI, speeding, illegal maneuvers and more. Navajo also receives alerts for non-driving offenses, license status changes due to suspensions, revocations, expirations and medical certificate downgrades. Being able to have all this data in one, easy to navigate dashboard allows Navajo to be proactive rather than reactive when it comes to its fleet’s safety and analyzing recruiting and safety practices. With more than 75 years of experience facilitating transportation solutions, Navajo Express’ services include dedicated fleets; intermodal; specialized equipment; and truckload services. With headquarters in Denver, Colorado and six other terminals nationwide, Navajo Express delivers superior results to business partners through advanced shipping concepts and world-class customer service. For more information on Navajo Express visit www.navajoexpress.com. SuperVision is a comprehensive fleet safety and performance management product line from Explore Information Services, LLC, A Solera Holdings, Inc. company. For over 25 years, Explore Information Services has been a leading provider of risk management information to insurance companies, government agencies and commercial fleets. For more information, please visit esupervision.com. Founded and continuously led by inventor and entrepreneur Tony Aquila, Solera is a global leader in digital technologies that connect and secure life’s most important assets: our cars, trucks, homes and identities. The partnership between Explore and Navajo is another significant milestone for Explore’s parent company, Solera, on its Digital Garage Fleet initiative. Solera has set out to shape the digital world in transportation and logistics by developing fleet management, driver services and digital sales solutions for participants in the global commercial vehicle ecosystem. Today, Solera processes over 300 million digital transactions annually for approximately 235,000 partners and customers in nearly 90 countries. For more information on Solera, please visit solera.com.